Five turrets, three cannons and six machine-guns crewed by a dozen men: This was no floating incarnation of Soviet power on the high seas but an early Red Army tank, the T-35 of the 1930s that charged to its destruction in the opening days of the Second World War. From their appearance during the First World War, tanks grew rapidly in size, power and armament until the fast-paced engagements of WWII brought them back into reasonable proportion. The first heavy multi-turreted tank was the French Char 2C, followed in the late 1920s by Britain’s A1E1 Independent, a formidable 33-ton machine with five turrets that never reached mass production but may have inspired the Soviet designers to go bigger. Crippled by the loss of many experienced engineers in the Russian Revolution, the industrial base inherited by the Bolsheviks was incapable of mass-producing modern technology and had to be rebuilt from scratch. But then Soviet experimental design came into full swing. Building light tanks was easier and could be learned by copying foreign models. But there was no ready recipe for heavy tanks, so these had to be freshly conceived, using engineering impetus gained in joint projects with German engineer Edward Grotte. 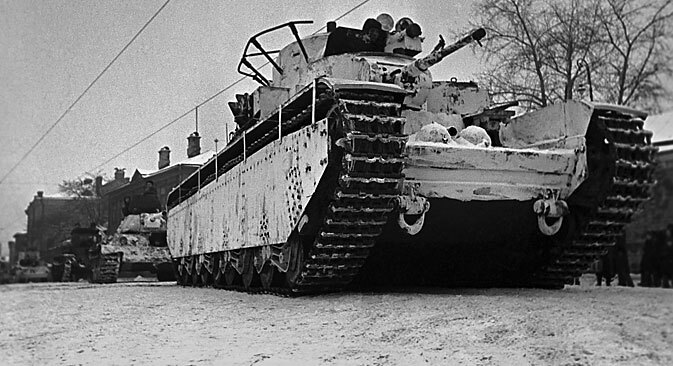 The medium TG tank of the Soviet-German design group did not make it into production but gave the young Soviet team invaluable hands-on experience. They progressed to bigger projects and soon designed the T-35, based on the TG, the German Grosstraktor and models imported from Britain. The tank was to weigh around 35 tons but overshot by 10 tons in the 1932 prototype. The resultant monster towered more than three meters high, its two-tiered turrets capped with 76 mm guns and machine guns that could rotate 360 degrees. Two smaller gun turrets with 45 mm cannons and machine-guns that could do half turns were placed fore and aft, while two machine-gun turrets and a firing port under the rear gun completed the tank’s arsenal. The machine was powered by a 500-horsepower engine and had a top speed of just 17 miles per hour (28 km/h) on the open road. The military accepted the tank but was dissatisfied with the complex chassis design and small engine capacity. In the early 1930s, Soviet strategists planned the next stages of tank warfare. Medium T-28 tanks would break through enemy defenses, T-35s would storm through and annihilate everything around them with their massive firepower, followed by a third wave of T-26 and even lighter models with machine-guns that would mop up with infantry support. However, the experience of the Spanish Civil War, Soviet border fighting with the Japanese and the Winter War with Finland demonstrated the danger of anti-tank artillery and the need to mount armor-supported infantry offensives. In such conditions, 10-50 mm tank armor was insufficient. Attempts to increase thickness drove up the tank’s mass to a prohibitive 55 tons, and no Soviet engine was capable of powering such a size. Another failing was the commander’s inability to lead firing from five turrets simultaneously. Designers attempted unsuccessfully to fit naval gun systems to synchronize multiple firing, and by the early 1940s the tank was already obsolete in both design and the tactics of its use. The T-35 did not see action until the German invasion of the Soviet Union in June 1941. Instead, it served more on the ideological front, dominating city squares as a symbol of Soviet military might and drawing huge crowds and observers from abroad. It featured on posters and the ‘For courage’ medal, where it lasted much longer than in real life. In 1943, when the T-35 had already been consigned to history, it was still fighting for the Motherland in Soviet propaganda. On the actual battlefield, however, it gave a less distinguished account of itself. Of 59 T-35s manufactured from 1934 to 1939, 48 of them entered the war while the rest were being repaired or used in training schools. The tank did not survive the first days of fighting since machines created for a sudden breakthrough were not capable of a long retreat. Only seven T-35s were knocked out in battle and the rest simply broke down and were abandoned by their crews. The Soviet 34th Tank Division, which had all the available units, was alerted on the early morning of June 22 when the invasion began. Three of the tanks broke down even before they went into combat, and after maneuvering through western Ukraine two days later only 10 combat-ready tanks remained. In the confusion of the retreat and the border fighting there is only one account of their combat performance. On June 30, 1941, a tank group that included four T-35s was sent to reinforce other units but came under attack while en route. Front turret gunner V. Sazonov later wrote: “Our last fight was stupid. First we fired across the river from the main turret on a hamlet called Sitna and then attacked with the remnants of our infantry. They faltered as soon as the German bullets started to whine and we then went forward and came under German cannon fire from the left. “I turned the turret to face, looked and looked but saw nothing, and then - wham, the turret took a hit. But you couldn’t stick your head out as bullets were showering on us like peas. The German shells hit us at five second intervals and no longer only on the port side. Then I saw a flash while we were still 50 meters from the hamlet, and one of our tracks broke. Since the German soldiers liked to pose beside the abandoned ‘Stalinist monsters’, there are many battlefield photographs of the T-35 despite its limited numbers and brief taste of combat. The outdated, five-turreted giant never proved its mettle and ended its days as an engineering gimmick, a symbol of military might like the Tsar Cannon of the Moscow Kremlin, which is believed never to have been fired in anger. The last remaining example is kept at the Kubinka tank museum outside Moscow, where it is a star exhibit, reminding visitors of the decisive design projects of the last century, when tanks learned to be tanks.